Fire hydrants are located in numerous locations to allow the fire brigade to access water from the local mains. As the Fire hydrants are located in numerous locations, some are owned and maintained by water companies or local fire authorities. Whilst the hydrants which are located on private property the maintenance responsibility lies with the owner, occupier or operator of the site. We currently look after hydrants in properties such as private hospitals, university campuses, retail parks, pharmaceutical warehouses, logistical and paper and packing. Why Should Fire Hydrants be Serviced? Underground fire hydrants require regular inspection and occasional maintenance in accordance with BS9990. This ensures they will work in an emergency situation allowing the fire brigade to connect their hoses in the vicinity of the fire to access water more easily. Image 1: Specialist Equipment required for the Major Service. Fire Hydrants require two services per annum, a minor and major. The Minor Service: ensure the cover is free of any damage or debris and is easily removable in an emergency situation. An inspection of the pit to ensure the surrounding is sound, to also make sure the pit is clean and dry. 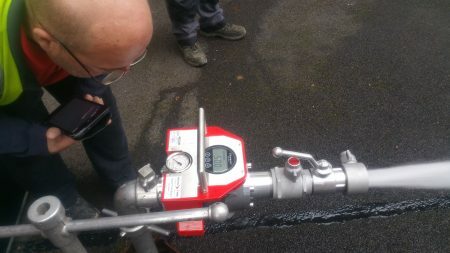 Once the pit has been checked the hydrant valve itself needs to be inspected. We believe the valve should be opened slightly to ensure there is pressure behind the valve. The outlet should be fitted with a cap which should be secured to the hydrant, there should also be a frost/cap valve fitted. 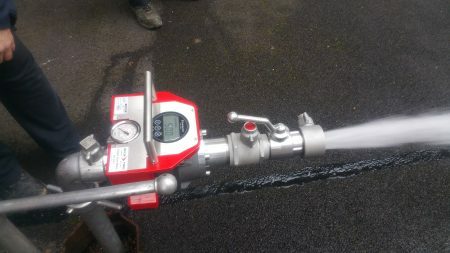 The Major Service: as the minor service however includes for the Fire Hydrant to flow tested using specialist equipment to the adequate rate for fighting fires, the results should be recorded and submitted to the client. Any defects must be notified to the responsible person immediately to enable repairs / replacements to be carried out. Image 2: Our engineer demonstrating a Fire Hydrant flow test.